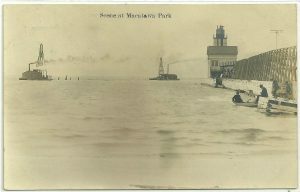 HOLLAND — The Holland Area Historical Society will host a program titled “Big Red Lighthouse: Aid to Navigation to Local Icon” on Tuesday, April 9 at 7:30 p.m.
Big Red lighthouse hasn’t always been big or red. Join local historians John Gronberg and Valerie van Heest as we learn more about this local icon over time and its importance to Lake Michigan navigation and Holland history. The presentation will be held in the Maas Auditorium, Maas Conference Center, Hope College, Holland, Michigan. Maas Auditorium is located at 264 Columbia Avenue on the Hope College campus. The public is invited, and admission is free.